MOSCOW (AP) The two most recognizable names in global soccer were eliminated from the World Cup on Saturday. But the first day of knockout matches still had plenty of star power. 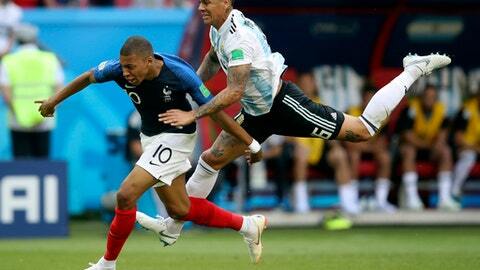 France’s lightning teenager Kylian Mbappe and Uruguay’s silky veteran Edinson Cavani each scored two goals as their teams knocked out Lionel Messi and Cristiano Ronaldo, respectively. This could have been the last time at the World Cup for both the 33-year-old Ronaldo of Portugal and the 31-year-old Messi of Argentina, and neither got close to a title. Mbappe is on to the quarterfinals at age 19, where France will face the cagey Uruguay squad led by his Paris Saint-Germain teammate Cavani and Luis Suarez.